At $70 MSRP, the Switch Pro Controller is one of the most expensive standard first party controllers (barring premium offerings like the Xbox One Elite), but it largely justifies its price tag by being one of this generation's finest game pads. While we've seen a number of interesting takes on the Pro Controller formula for Nintendo's console, a less expensive, fully wireless option would be very welcome. Enter PowerA's Enhanced Wireless Controller for Switch. It comes in a variety of flavors, both standard color variants in black, white, and red, or skinned with one of the most high profile Nintendo IPs. We received the Princess Zelda model from PowerA, but versions with Mario and Link are also available. 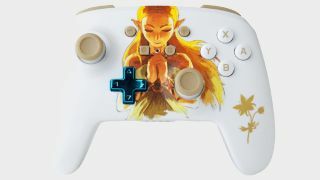 My personal favorite, at least judging from PowerA's product website, is the Link Silhouette model, which features the iconic hero astride Epona in black on forest green, with a gorgeous gold d-pad that really pops against the muted background. The Mario offerings are a close second, especially the Retro Mario skin that shows everyone's favorite plumber mid-jump, rendered in the style of the original Super Mario Bros. on NES. There's also a Diablo 3 version, presumably to commemorate one of the few times actual Hell has made an appearance on a Nintendo console. They're all lookers and, to be honest, the Princess Zelda version is probably my least favorite of the bunch. It's not just aesthetics, either. Powered by a pair of AA batteries, the Enhanced Wireless also comes with a dedicated power/sync button on the rear middle of the pad, and two extra bumpers on the controller arms, à la the Elite Controller's paddles or the Astro C40 TR. The back plate of the controller is also swathed in a nice no-slip plastic material that feels like it actively wants to cling to your hands (in a pleasant way). Even with the batteries in it feels a bit light, and sticks are fairly loose, though whether that's a pro or a con comes down to taste. The buttons feel nice and snappy and responsive, and there's a very short throw on the triggers, which seems a bit odd on a Nintendo controller but is great if you want to spam shots in Splatoon 2. It'll also work with Steam and, with a little trickery, your larger PC game library. For $49.99, you could do a lot worse.